I thought it would be appropriate to introduce our readers to a world that was completely foreign to me a month ago – designer toys. It was late June and we were putting the finishing touches on our 2010 program. Just a few hours before we planned on notifying the selected filmmakers, a lonely envelope appeared in the ACEFEST PO box. Little did we expect the contents of that unsuspecting 6×9 package had the power to send us back to the drawing board with our latest schedule draft. ‘The Vinyl Frontier‘ was a pleasant surprise, almost as if it were sent from the heavens above by some mystical cinematic force. It opened our eyes to a world of creativity, expression and collective passion. 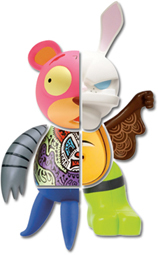 Designer toys are short-run, limited edition items made by artists from all over the world who come from all corners of the industry including graphic design, illustration and painting. The now massively popular art-form originated in the 1990’s and still has unlimited growth potential on a global scale. ‘The Vinyl Frontier’ takes the audience on a journey into this underground world introducing us to the legends in the industry as well as outlining the fascinating process of making these figures from concept to completion. This documentary has plenty of local appeal, wonderful stories to be told and an incredible perspective on a sub-culture you may never have known existed otherwise!